Above is a video we just posted to You Tube that contains audio as recorded by Steve Baranek of Gloucester Animal Control on July 26th, 2014. The audio file is DW_D0503 and was submitted into evidence to bring two counts of misdemeanor charges against Laura Crews of Gloucester. Listen to the audio clip. Its 33 seconds long. Within the first 30 seconds Steve makes 3 admissions. He admits that he is just walking around killing a few minutes. The second admission is that there are no animals at the yard sale he is at and the third admission is that he is somewhere he should not be because he states, "I can not go shopping on company time". The accusations of statutory violations filed against Laura Crews are 19.2-415 for Disorderly Conduct and the second one is 19.2-460 Obstruction of Justice. Now if you read Virginia Code and look at the annotations on how that code is to be used, in Washington v Commonwealth, 2007, S.E.2d 485, it is clear that law-enforcement must be engaged in their lawful duty in order for there to be an obstruction of justice. A police officer sitting at a desk waiting on transportation of Washington, when Washington stated he would kill the police officer, the police officer was not engaged in a lawful duty where obstruction of justice was claimed as a violation. The court threw out the Commonwealths accusations. So again, looking at Steve's own admissions above I can not begin to see where there is any valid claim on these accusations of statutory violations. Here is the information he provided to a grand jury in Virginia Beach. You can click on the image to blow it up for easier reading. This is the same complaint written by Steve Baranek that is in the video above. It seems as though Mr Baranek has committed fraud and perjury here. He knew through his own admission that there were no animals at the yard sale but claims the yard sale was a Chicken Swap which would indicate a potentially valid reason for being there. (I say potentially valid reason but in my view even if animals were there Animal Control has no legal right to patrol. Virginia is a Dillon Rule state and the state, from what I have tried to find, does not allow Animal Control the ability to patrol public areas, streets, highways and or buildings). 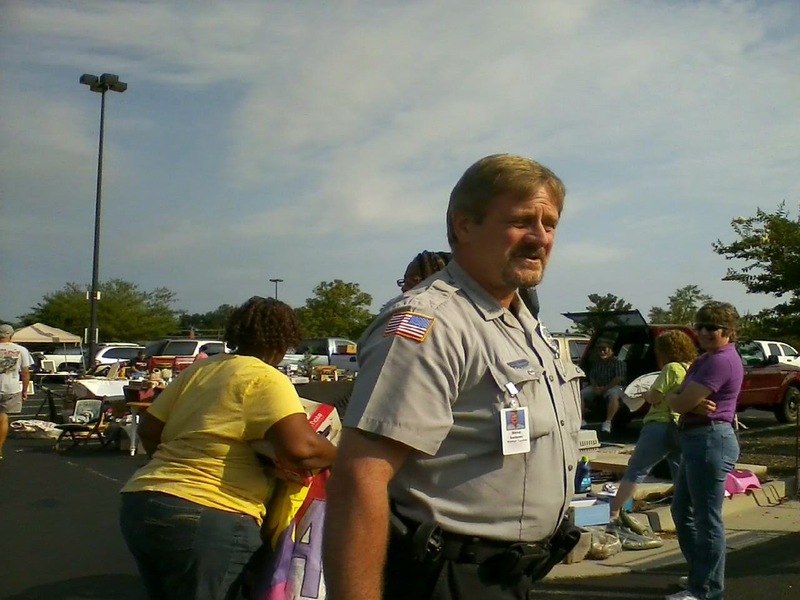 The claim of calling the yard sale a Chicken Swap is where Steve has committed perjury in my view. I say my view as I am not an attorney and I am not trying to practice law. I am only a witness to just about every event of this case except the July 26th, 2014 situation. I am only reporting the information as I know and understand it. The above has been reported to Holly Smith, Commonwealth Attorney for Gloucester 9th District. We are waiting to see what she says on this. 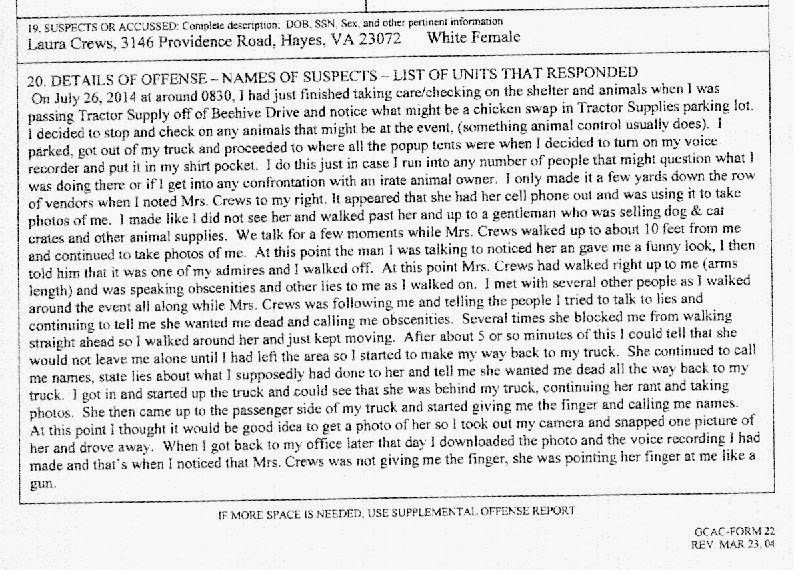 We have so called witness testimony provided by prosecution that actually has 4 so called witnesses against Laura Crews for the accusations of statutory violations, but the records show that the testimony actually works against Steve as they all state that Steve was at a yard sale. (Not acting in an official capacity). I also call the so called witnesses such as the prosecution has failed to provide evidence of witnesses against the accused in violation of rules of evidence even after she stated in court she would do so. A motion to quash was filed against any form of witnesses because of such by Laura Crews. What is even worse, the audio evidence was provided to Laura, by the prosecution. I have to assume that the prosecuting attorney was to busy to listen to it to realize what the audio actually contains. This would seem to me to be malicious prosecution by the prosecutor for the case. A motion to dismiss is now before the court for lack of subject matter jurisdiction. A motion to show cause has also been filed to know by what authority Animal Control has of patrolling public areas, streets, highways and or buildings. So far, not one motion filed by Laura Crews has ever been answered by anyone at anytime all in violation of court rules. How does that work? She was told in court that she has to follow the rules, but no one else has to? And she is the one facing criminal sanctions? I really do not understand how that works. But that is the question of a reasonable person and we must not be dealing with any form of reason here. Who knows maybe they told her she "SHALL" follow the rules of the court which would mean that sometime in the future she may follow the rules of the court if she so pleases. (Look up the definition of the word - "SHALL"). (in the first person) expressing the future tense. "this time next week I shall be in Scotland"
expressing a strong assertion or intention. expressing an instruction or command. used in questions indicating offers or suggestions. "shall I send you the book?" Gloucester Animal Control Evidence of Fraud?